You are currently browsing the nEx.Software blog archives for July, 2009. Yesterday, I was perusing the forums over at www.androidandme.com (as I often do) and one of the members had posted a question related to development. Of course, I hunt these down and pounce whenever I see them. So, on to the question, which I am going to strip down to the scope of this post… How does one write a custom Analog Clock Home Screen Widget for Android. So, as I am sure you have already guessed, I have decided to write a tutorial (with code) to explain in detail how to do just that. Before we continue, I should point out that as I am writing this I am going to assume that you have obtained, installed, and know how to use the software tools for Android Development. For the purpose of this tutorial, these tools are: JDK 1.5 or higher, Android 1.5 SDK, Eclipse 3.4 or higher, and the Android Development Tools Plugin for Eclipse. In BarTor, we custom draw a lot of our controls, and we do this for a couple of reasons. First, we do this so that we can have better contol of the overall look-and-feel of the application, and we also as a framework for color theming capability (in other words, allowing the user to pick his/her own color scheme). It is my goal to write a series of posts that outline some of the Android drawing classes and methods and how to use them in your own Android applications. While the focus of these posts will be on how we have used them in BarTor, we will certainly be presenting them in a way that makes the information usable for any application. Stay tuned, the first post in this series is coming soon. 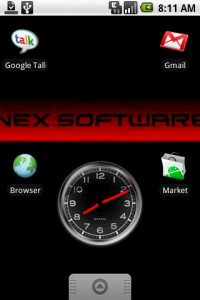 So, it might seem that we at nEx.Software are focusing on the website and shirking on development of real applications. Trust us, that is certainly not the case. We are currently working on several projects, one of which is a major upgrade for current and future users of BarTor. We have a lot of features that we have been wanting to implement and feel that now is the time to do so. I will create a separate post for BarTor specifically outlineing what we intend to do and hopefully set down some goals as far as time lines. Other projects we are currently working on include: A networked multiplayer game, a Virtual Keyboard, and several others that haven’t completely taken shape yet (so we feel it is best not to mention them specifically here at this time). Wow! Building up a site is a tough thing to do. Don’t get me wrong, using WordPress as a base certainly makes it easier than it would be otherwise, but it is still quite the undertaking. That being said, I think we are making great progress so far and have gotten a lot of the main design hurdles out of the way. We will continue to develop and add content over the next few days and weeks and hope to get into regular updates on the progress of this and other projects we have underway. Stay tuned. My First Blog Post… Ever. Alright. Let me first start off by saying that I am not a blogger. As a matter of fact, on many occasions I have flat out denied having any real use for a blog. And that is still basically true. Most times I find myself struggling to find enough to say to my friends and family, let alone a bunch of strangers on the Internet. Be that as it may, here I am, staring at a blank page, and writing about how I don’t think I need a blog. So, why am I here? I feel it is time to try to connect better with the world in which I spend so much of my time and which has come to affect all of our lives so deeply. Yes, I am talking about the Internet, or rather, the Web. But that is merely semantics, right? So, what am I going to talk about here? I don’t know… You tell me, what do you want to hear about? I have a loose plan to write about my experiences in software development. I can make no guarantees as to what that might look like, or ultimately amount to, but I hope it will be something good. Again, I look to you for encouragement and suggestions. What I can tell you is this: There will be heavy focus on Android development here. There are a number of reasons for this: First, I find it most interesting at this point in time, and I spend a lot of time doing it. Second, the Android community has been such a big help to me, and I feel it is time for me to give back to that community. Lastly, and this is somewhat selfish of me but whatever, I feel that Android provides the best opportunity for me to develop a lasting network, and help to drive my career in the way that I want it to. Aside from Android I also hope to cover other technologies with which I work to varying degrees, including Microsoft .NET, Adobe Flex, and others. So… Welcome. I hope you find something you can get interested in and I appreciate any comments, suggestions or anything else you might have to say.